Two sophisticated suicide bombings, including one on Tuesday in which 33 people died just outside Baghdad, and other recent violence are raising fears that jihadi militants and hard-line Baathists may be renewing their deadly partnership to threaten the largely calm Iraqi capital. Iraqi military leaders emphasized that it was too early to draw any firm conclusions but noted similarities in the attacks in which more than 60 people were killed since Sunday. At least 7 of the 33 people killed were Iraqi Army officers. ...three Iraqi soldiers were killed and up to 14 people were wounded in two separate explosions in the northern city of Mosul. The three soldiers were killed by a car bomb in western Mosul, the U.S. military said. Two soldiers and 11 civilians were wounded. In the second explosion, an unknown gunman threw a grenade at a police patrol in central Mosul, wounding two policemen and one civilian, an Iraqi security official said. He spoke on condition of anonymity because he was not supposed to release the information. A car bomb also exploded as a police patrol passed in the northern city of Kirkuk, killing two civilians and wounding four children, police spokesman Brig. Gen. Sarhat Qadir said. 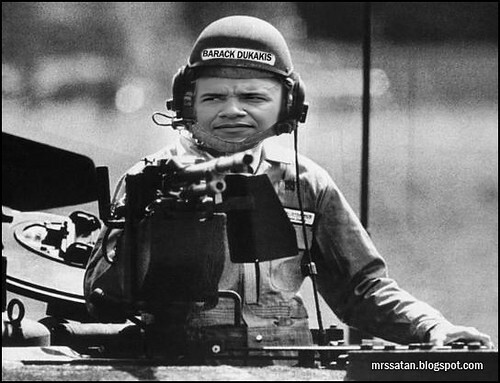 "He's ready for his Dukakis Close-Up, Mister DeMille." I estimate that Barack Hussein Pbama, Junior is closing in on his first 1,000 deaths in somewhere around a short 50 days in office for which he is directly, completely, wholly and fully responsible. I bet he'll celebrate this by throwing an elegant and expensive White House party!